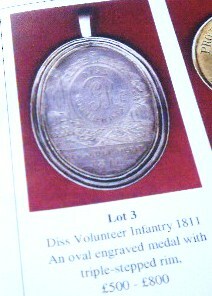 Diss Museum is celebrating again after acquiring a rare medal at auction. It was awarded in 1811 to Jabez Waller for proficiency at military exercises with the Diss Volunteer Infantry. They were the Dad’s Army of their day and drilled on Diss Common when there were fears of Napoleonic invasion. Museum manager Basil Abbott appealed for financial help and, within two days, had raised the money through the generosity of local people. Museum member Brian Jones went to the auction at Fakenham and successfully bid £600 for the medal.